Purchased with the assistance of the Story Fund, 1988. Vase of slender baluster shape with birds and wisteria flowers in colours and silver wire on a dark ground. Silver mounts. Signed on a silver plaque: Kyōto Namikawa. The flowers are balanced all around this vase. 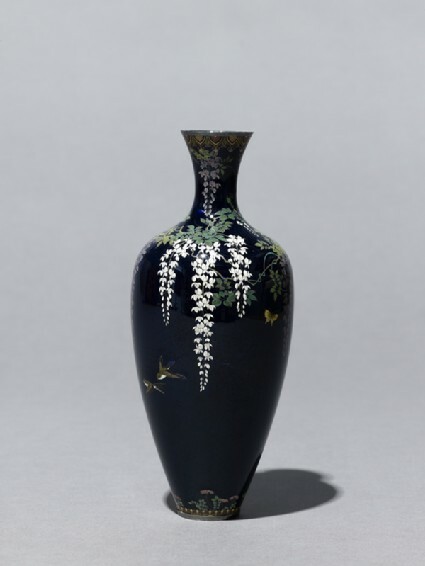 After this the next of the stages in the evolution of Yasuyuki's work, shortly after 1900, was the insistence on a front and back to any vessel; thus there is a main picture as the front and a minimal picture at the back. This leaves a lot of open space unsupported by wire. Frequently the wire is silver, sometimes gold [see EA2000.180]. Borders have been reduced to the minimum, thus emphasising the tall shape. Yasuyuki never used the new exotic techniques that were to be exploited by other artists, preferring to use wire in his own ways [see EA2000.48 and EA2000.180]; here he has actually shaped the "wire" so that it tapers and alters in thickness as if sculpted. Thus he never used moriage (relief), [see EA1998.214] or plique-à-jour (unsupported cloisonné, [see EA1990.5], or even the so-called "wireless" cloisonné (musen).